Attention to all the lady crafters (and guys who want to please their significant other). 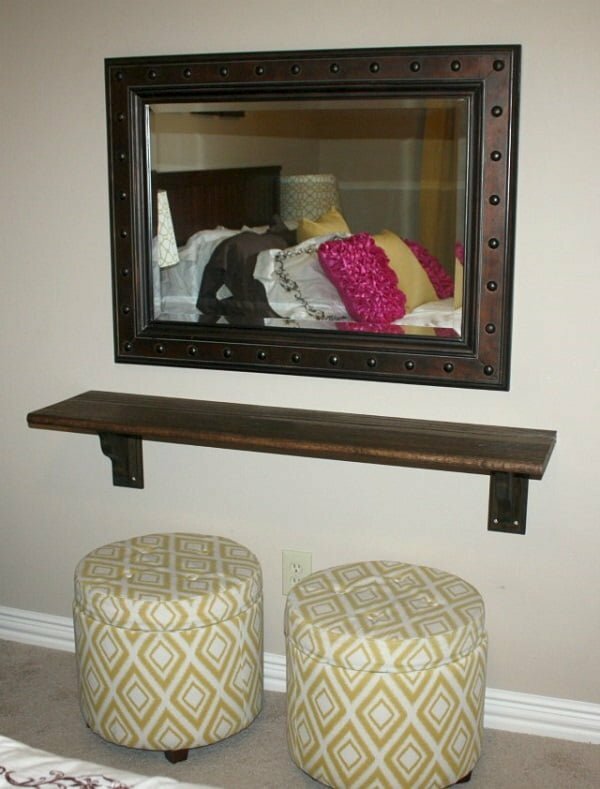 You have to see these DIY makeup vanity table ideas and plans if you want to build something special. Whether it’s a simple vanity table with a mirror that you’re after or one with makeup storage and organizer, you will need these tutorials. Most of these vanity tables are small enough to fit in even very limited spaces. And they’ll definitely add a lot of interest to your home decor. Check out these 15 great ideas and select your style. There isn’t anything more glamorous than a glass top, which gives any vanity a touch of beauty that would be hard to rival. You have the skills to make the base, and all you need is the mirror and the glass to top off the look. All you need is a few 2×4’s and a few drawers of the same size to make this vanity. Of course, you are going to need a good vanity mirror, preferably one with good lights to help illuminate you while you are doing your makeup. You will finally have all your makeup in one location. This one is pretty simple. 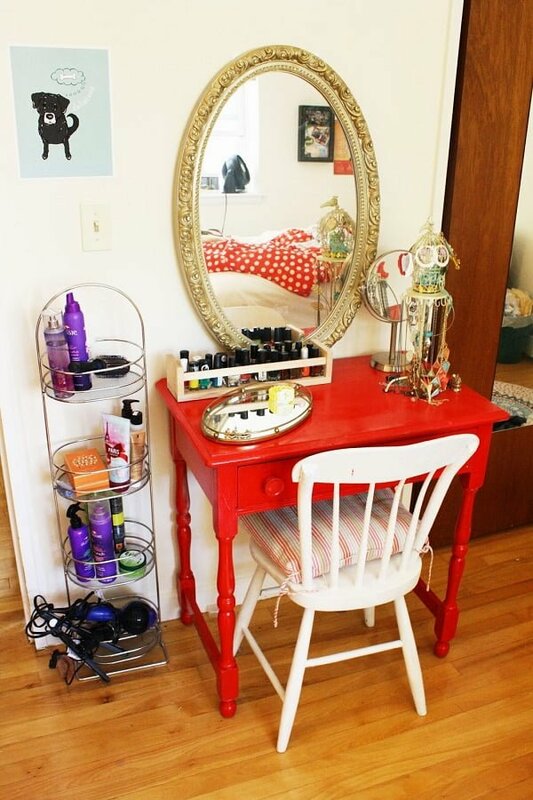 You will be using Ikea’s Malm dressing table and will convert it into a makeup table. 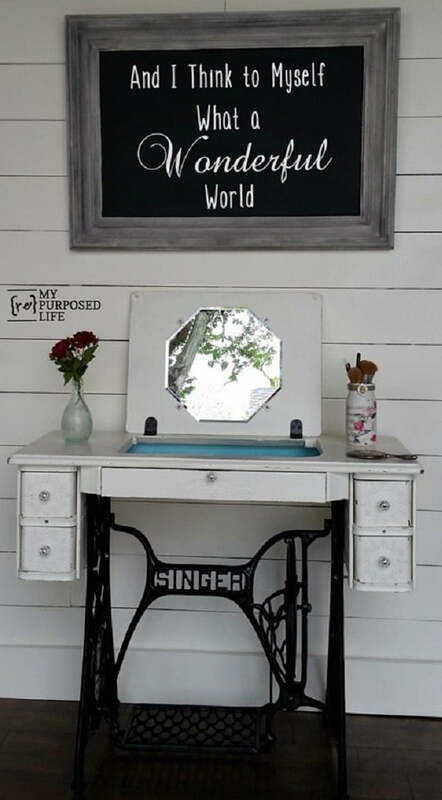 You will be adding a fancy mirror and a few little things you might need like a hair appliance caddy. Of course, you can add other things you want. If you fancy repurposing existing, less used furniture, you would love this project. The project entails making a desk, side table, jewelry organizer, or a versatile makeup vanity out of a classic Singer sewing machine. To get started, all the sewing machine hardware must be removed. Once you have unscrewed and removed all components of the machine, you would be left with the drawer frame and chassis. You would need some spray paint and paint primer to cover the blemishes of the machine. You may also resort to some textured stenciling if you find the drawers a bit too plain. This is a “strictly ladies” DIY makeup vanity project. 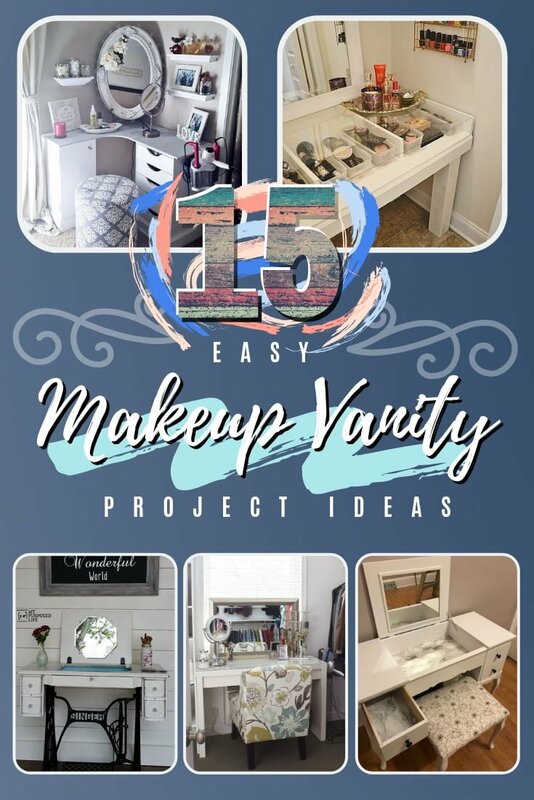 If you want that makeup vanity desperately, you shall give this project a try. An IKEA or similar furniture would serve as the base and the remaining items can be bought at a local hardware store. Some of the other items you would need are a mirror, a couple of wall lamps, round light bulbs, extension cords, power strip, etc. Besides the standard painting and screwing, there is also some basic electrical work involved. This drawer would, no doubt, serve as a place to keep all your makeup and hair products and tools organized. 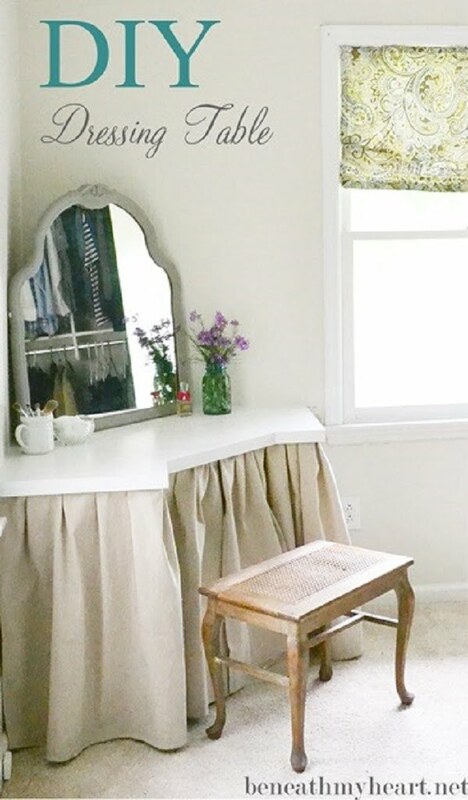 If you have a makeup vanity table in a dilapidated condition, this DIY project shall help you restore the table’s pristine past. You’ll invariably have to do a good amount of sanding and filling in of the holes or cracks for this project. If there are any ugly drawer decals, they would go out. You can make do with the existing mirror if it’s not cracked. Some elbow grease shall do the job if the mirrors require cleaning. A new mirror would likely be on the cards only if the current mirror cannot be restored to its original condition. If you want to add a dash of flashiness and dazzle to your thrift store furniture, this silver leaf DIY project is what you need. You would need more than sufficient amount of silver flakes, and must be ready to have some of the flakes stuck to your hair. 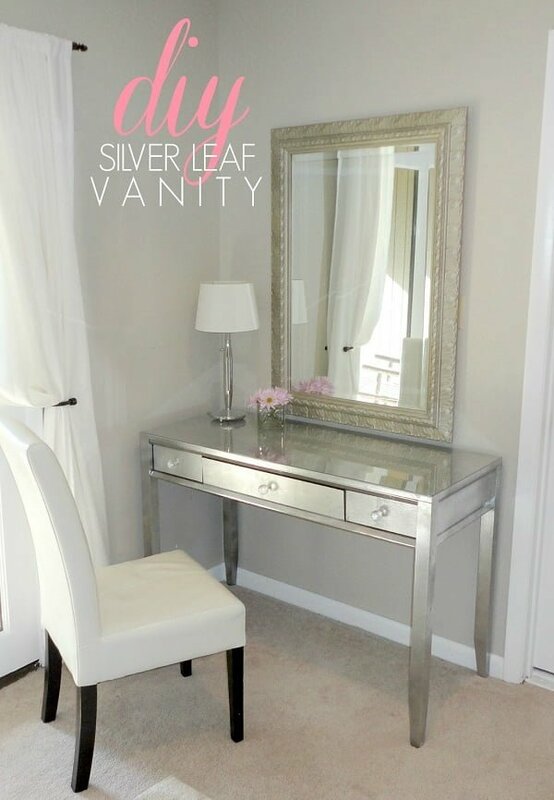 This silver leafing can be done to a desk that either has no cosmetic issues or shows signs of wear post-exposure to hairspray, makeup, and the sporadic flatiron melting. The project is time-consuming (around four hours) and also extremely messy (glitter all over the place), but is not complicated at all. 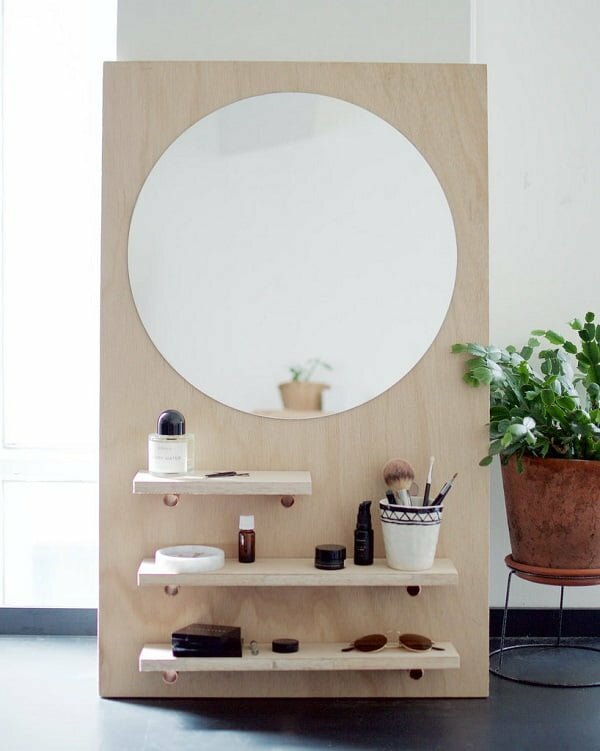 This project is all about setting up a dressing table in your master closet. It’s for people who do not want to deal with a messy bathroom sink countertop. The positioning of the table must be determined after assessing the window positioning and natural lighting situation. Invariably, corner space would be the ideal spot. Since the project entails attaching the table to the wall, good amount of measuring, screwing and cutting would be required. If the table is heading to the corner, a crossbar must be created. For some additional support, a couple of 2×4’s could be attached underneath. This makeup vanity table comes with all the bells and whistles usually identified with makeup vanities. The table could also be used as a work or office desk. This project is slightly complicated and warrants a fairly large list of materials. But once things are all put together, it would be all worth it. The project can be categorized into multiple steps, including sanding and assembling, setting up the mirror frame, adding electric fixture, putting the electric box cover in place, applying a finish, adding the mirror, adding required hardware, and wiring the switch and outlet. 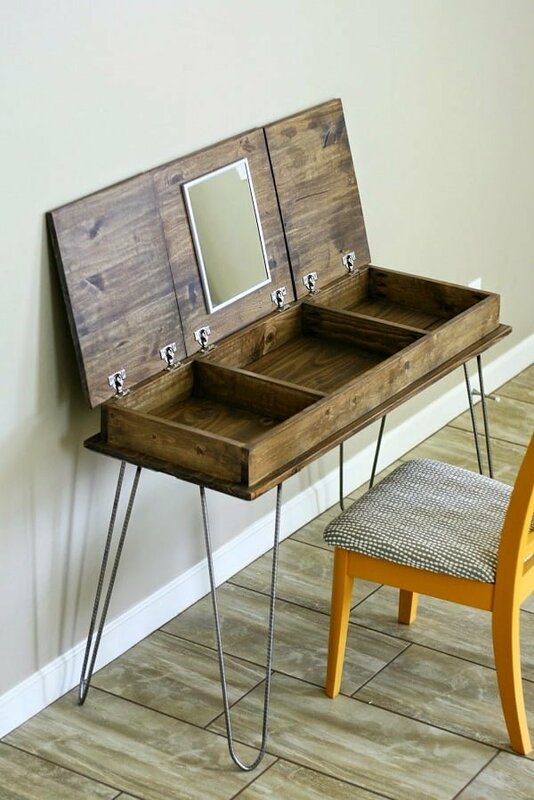 Men can try building this vanity table for their wives or girlfriends who do not have a dedicated vanity table and are usually seen doing makeup and hair in the bathroom and other odd places in the house. 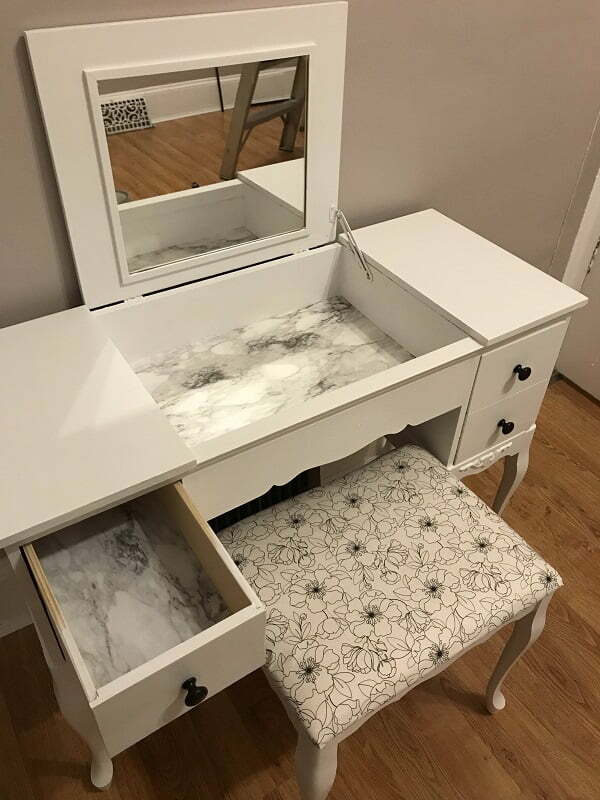 This vanity table doesn’t just look elegant but is quite functional too, besides hiding all the makeup supplies. The flip top design is ideal because it can work as a regular desk when it isn’t used as a makeup vanity. Also, some kind of power strip, side hooks, and/or a pass-through could be attached to the table, so that they come in handy when using a hair straightener or dryer while seated at the table. 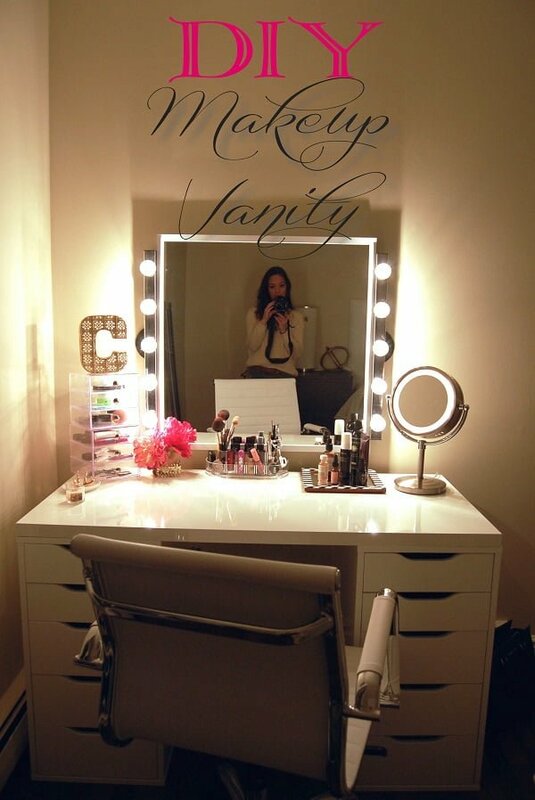 This makeup vanity table would be appreciated by all women, especially moms. This is a simple and minimal, yet elegant makeup vanity. The vanity table is modern, with clean lines. The four hairpin steel legs look pretty clean and are (not surprisingly) extremely sturdy. When viewed from a distance, it looks as if the table has no legs at all. This table is a flip top design and has got a good amount of storage within, where you could easily stash all your hair and makeup supplies. If your mom has bought a new house, this table would look perfect in her bedroom. This is yet another vanity table made out of a sewing machine table. If you do not already have a vintage sewing table in the house, you can easily buy one at a yard sale. This simple and elegant vintage table would fit in well if you’re looking for a modest furniture piece to store your makeup accessories and jewelry. You would have to do quite a bit of refinishing and also attach drawers to the sewing table. If you have a complete toolset, this project should be a breeze to get done with. It should take around six hours to complete this project, plus drying time. 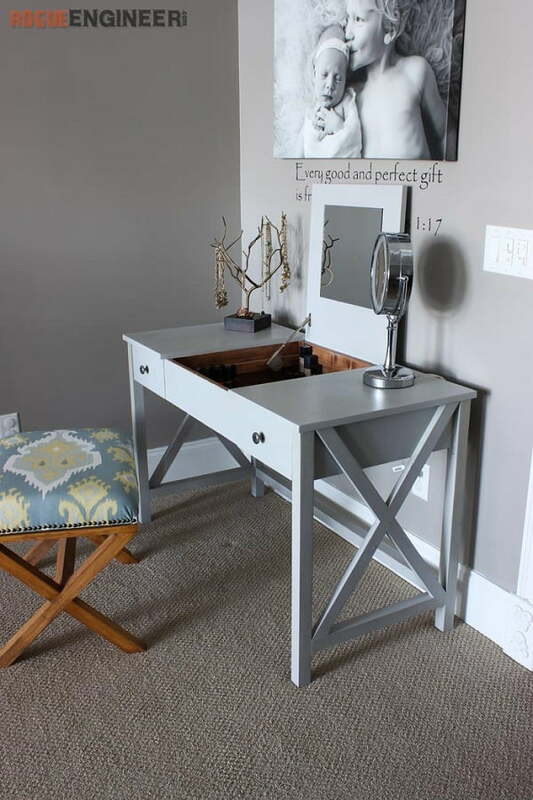 This is a super fun, simple vanity table project that conforms to your limited budget and physical space. If you live in a rather small apartment and do not want to do all your makeup in the bathroom, this small table shall do it for you. Also, it makes your bedroom look classy to a great extent. To make this DIY vanity table, you may not buy a lot of fresh supplies. The majority of the stuff that goes into making this table can be found in your house. This is probably why the table is ideal for students or people who have budget constraints. This DIY wall vanity project entails usage of polyurethane and stain and could take approximately two days to complete. However, the project is quite easy to execute. 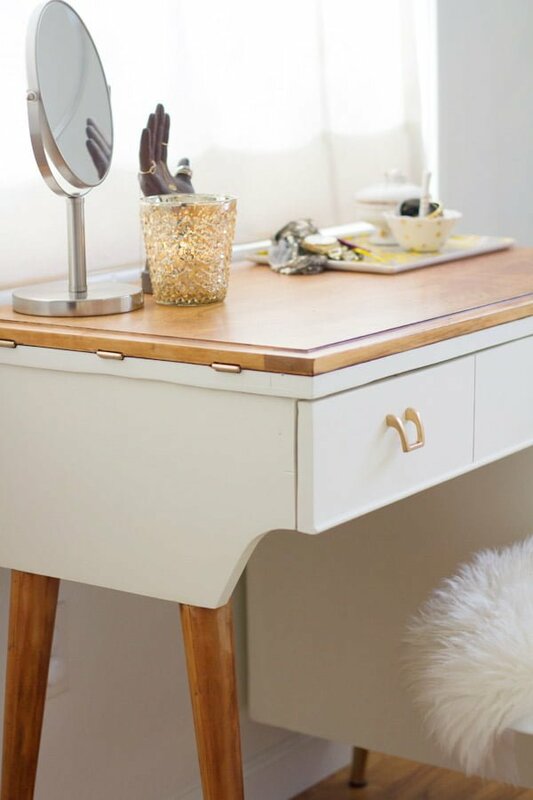 The table has a vintage look to it and is not uni-body like most other DIY vanity tables. The mirror, the desk, and stools are all isolated and distinct from each other. You would need a stool or two for this project – a bench would do the trick too. The stools could also serve as storage areas, which is why a couple of stools would be handier. The polyurethane coating may require at least eight hours to dry, and a secondary coating could be needed. If you like crafts, this pine makeup vanity table project would be the platform to showcase or hone your skills. This vanity table isn’t your regular vanity table. The complex, yet elegant design would prompt you into thinking the amount of effort and time that would have gone into erecting this beauty. Also, this DIY vanity table project requires a drill/screwdriver. All of this might sound daunting but if you have the knack for tools, you shall be able to embrace things and move with the flow in no time. Once done, you would suddenly have plenty of space for your makeup, hair and skincare supplies.